Submitted by Fester Pot on 2013-06-29 10:21. Please do not upload Shadewood to Steam Workshop. "The creak of branches catch your ear as you come to the boundary of the wood. Known to many as the Forest of Mir, the wood has grown out of control over the past few months. The trail left behind in Almraiven has brought you here; a foul wood that has been attacking those along the Western Passage, or so the locals of Almraiven have said. Branches reaching a little too far, roots curling upward to entangle the passer-by and wandering spirits have been on the tongues of many. It is here your investigation continues. What started as a simple investigation will end with the Auren Society of Weavers closing the pages of old and opening up a new chapter in the Arts of the Arcane. Bring your skills Weaver, for you will need them all." Latest module update - December 15, 2010. Gameplay Length: (6+ hrs) Gameplay hours is a result of following the main adventure. Hours will vary depending on how many side-quests you decide to take on while exploring the wood and surrounding region. 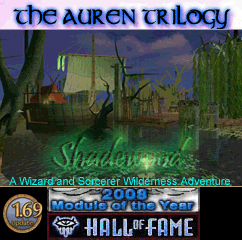 NOTE: You must have played and completed Almraiven to play Shadewood - Meaning you need the required database files in your \NWN\Database directory. This is a continuation, not a stand alone adventure! The adventure takes place within the nation of Calimshan in the Forest of Mir, Spider Swamp and Marching Mountains. 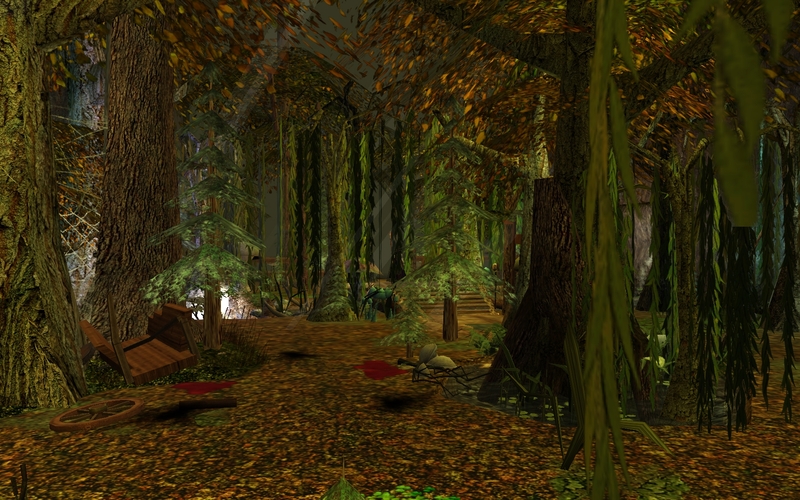 Shadewood is a full wilderness adventure and is the second and final installment of two modules. Please do not upload this content to Steam Workshop. I liked Almraiven. If I get some time to play modules, I'll try this one. I played it now and enjoyed it a lot. The only thing that was a bit annoying was that I often got stuck between too many placeables. Twice so bad that even the makesafe command didn't get my toon unstuck and I had to reload. Despite that this was one of the best modules I've played. Thanks Zwerkules! I do hope you enjoy it when you find the time. Well, first things first: this is probably the best series of modules I've ever played. Every minute of it I felt invested in the story and as if my character was a part of the world. All this potion brewing, book reading (absolutely love this idea ^_^), ritual performing activity makes you really feel like a mage, a person with some arcane knowledge. During this story weavers seemed like a distinct social group and this was very enjoyable. An attention to details is noticable everywhere thought the series and you keep it on the highest level. I do hope that we will see the grand finale. Ending is a very important part of any story, something that makes it complete. Thank-you for the kind words, Peyrite! I'm sorry for the late response, and there is a third module in the making, but I have nothing to share on when it will see the light of day at this time. Thanks for commenting and playing the series. I love this series!!!! It looks gorgerous, and all the custom made content is mindblowing! But I am stuck right at the end, in the mansion. I have no idea how to destroy blue bind, which was supposed to be simply dispelled. Can someone give me a hint? Hrm. Blue, I *think* is the music box. Another player had e-mailed me a similar issue with their saved game, and it was a variable not set. I'll dive into the module and see if it is the music box or not. Do you have the music box completed, and played the chime in front of the door? The music box worked, I had problem with one of two blue binds, thin ones. It says: "Only one thin blue bind pulsates here and to remove its energy, it will need to be dispelled." Has it someting to do with the "Simple Necklace"? Nope, not the simple necklace. I checked the variables set for this particular part of the barrier. On the main floor, in a back hallway with four doors, the furthest door on the right, is a room. In this room, a Weaver's Staff would have spawned and attacked. It must be killed - that is one of the blue barriers. On the second floor, in the secret room of the library, is the second Weaver's Hands. It must be killed - that is the second blue barrier. If you're still having issues, just send me an e-mail through this site, then I will respond to you, and when you respond back a second time, attach your saved game. I'll look into it if you've done the two above combats already. The ending was a suprise. I didn't know what to expect, but it fits perfectly. And such a cliffhanger! Ah! Yes, quite sneaky being invisible. Glad everything worked out and you made it through the final battle! Thank-you so much for taking the time to play, comment and vote. It's appreciated. Aye, i too have to say these modules are best you can play, especially for the level of details. The only flaw, but technically it's intentional, is that you have to be a wizard or a sorcerer. It does have his sense, of course. However Almraiven is unsurpassable. If Bioware guys would have made a work like this one, they would have probably sold much more. Ah, by the way, did you make some changes from the first release Fester? Becouse i didn't remember almost all forest areas totally dark. 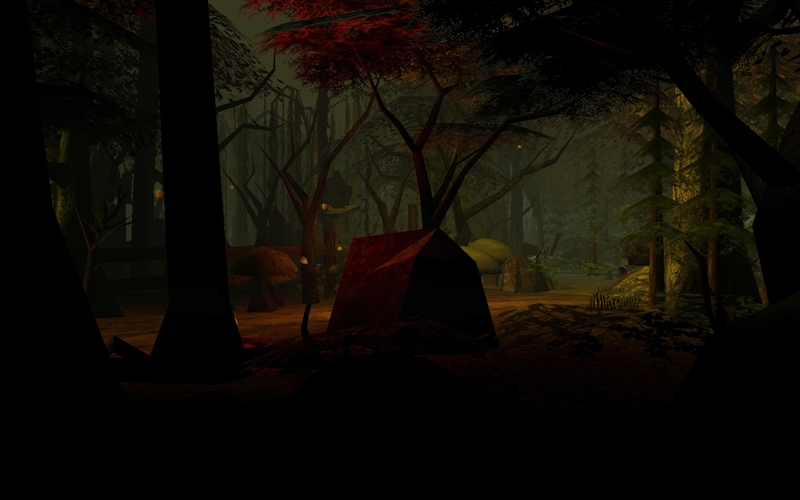 For the last update to the modules, the region of the Forest of Mir was made darker. I found that they were a little too bright for my liking, and made the areas fit more with what was happening in the region. Thank-you for taking the time to comment and play, NicotineCaffeine! By the way, could you give us some advices (no, i won't write 'pieces of') on how better move through the totally darkness areas? Becouse with all the props sometimes it takes even 5/10 minutes to simply move forward few meters... And that can become pretty unnerving. 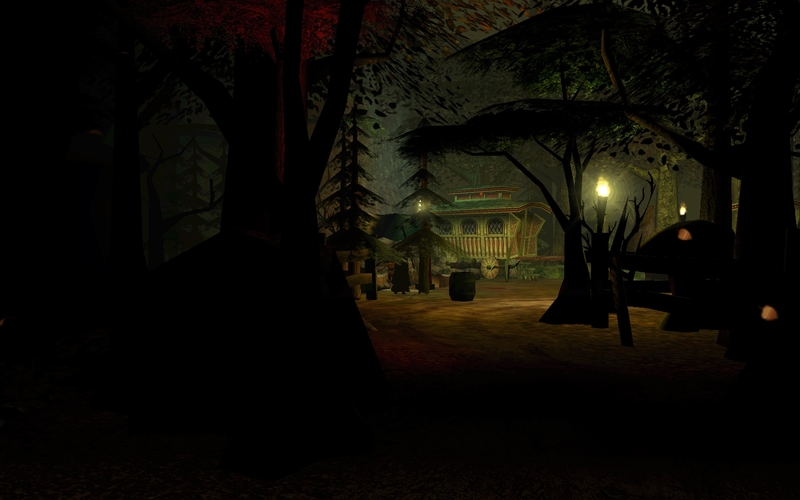 Most of those areas are designed to showcase the Darkness entity. There are a few tough pockets - Behind the One Copper Inn, the underbrush heading to Hagra's Tower, opening up the One Copper Inn - but otherwise, I did my best to place them in corners and locations one cannot access. A torch can help, as well as using W, A, S, D vs. the mouse to avoid the mouse-click beeps. "as well as using W, A, S, D vs. the mouse to avoid the mouse-click beeps." The sound i hear almost all the time. so... i hope you get the 16k problem solved and we can look forward to the nest one ! The Marching Mountains just happened to be the last area designed, and one I did have difficulty putting together idea wise. You mention the pan flute, which is what I came across on Freesound's website. Once I heard it, it was if everything just started to come together. It's a lovely piece indeed! And the 16k problem has been solved, by deleting all the .nss scripts. If I need them while testing, I just copy them back over. Thanks for commenting and playing the series so far! so, if i get that right, is there hope for a part three to come ? That would be great news ! It seems I've run into a bug and never received the quest to repair the bridge in the forgotten cave. The dialogue when approaching the bridge never showed up (it's possible I aborted the message by hitting escape by accident before noticing it...). Approaching the bridge again does nothing, and I can't interact with the rope. Unfortunately, I've played quite a bit since then and the only save I have before that point is right at the beginning of the module. Is there anyway to get around this through the console? I guess I could just teleport my character to the other side, but I'm afraid to mess up the quest even further by not starting it correctly. The quest is just that - getting over the other side. The aborted conversation just mentions the bridge needs fixing, and then gives you the quest, as well as creating a useable placeable rope to put the required rope into. Diverting this requirement will not cause an issue to the game, but it will remain incomplete in your journal. Feel free to give yourself 25xp as if you had placed all three ropes into the coil of rope - even though it did not spawn. To cross the bridge, simply approach the very edge and it will jump you across to the other side. If you're already by the edge when you set the variable, step back a ways, then approach the edge for the auto AT. That worked like a charm - thanks for the quick answer. I whent through the swamp, continued to Volothamp. I have explored the Forest of Mir and Deadwood (and various ruins, tombs, houses towers, caves etc, killed the banshee and the vampire, found the dying man in the capin etc). But I have still to find a library and/or laboratory. I have many quest refering to these, but cannot seem to find them - is it intentionally or have I missed something. Aunt Aries book suggest it is in Volothamp. Am I supposed to have found it yet? Am I suppose to talk to someone. There is an abaondened tower in Volothamp, am I suppose to be able to enter behind the bookcase on the second floor (or do I need to finish a quest first?). Or is it somewhere else? It seems most (all?) of my quests needs me to do something else before I can move on, learn a laanguage (library) or brew a potion (laboratory), or findsomeone I cannot find Aunt Arie or Hagra, or women trapped in portrait. I would be happy if you could point me in the right direction, without giving away too many spoilers. -Am I supose to have found a library yet (perhaps the strange language is a key to advance the story?). -Am I supoose to be able to talk to any of the spirits floating around? -When I started the Tyner and Kat quest, I thought this might lead me somewhere, but again I need a potion brewed: a tracker potion which does not need a laboratory (?) but needs an owls eye, which I cant find/have. Is there a way to get one before your are at the laboratory (killing the owl in the temple?). Update: completed the Tyner and Kat quest (one dead owl later). Do I need to do something with the granite ring (other than wearing it). The laboratory is in Volothamp, and one of the spirits there by the Tower Bell will give you a granite ring (you may have this already). The granite ring is a hint, and will also update your journal when you've received it. The ring was made from granite stone somewhere in Volothamp. From there, it's just a matter of wearing it and walking around to find the illusion. The ring will grow warm with a conversation description, so you'll know that you have found it. - You can find the laboratory at any time, so long as you've received the granite ring and are wearing it in Volothamp to break the illusion that is hiding the entrance to the laboratory. - Your library is in the same location as the laboratory. - At this stage of your adventure, there is only one spirit who can kind-of communicate with. This will be the spirit that gives you the granite ring. - I cannot recall offhand regarding the Owl's Eye being anywhere else but the temple owl one can kill. If I did add a secondary location, it would be the town of Reedmire in the Spider Swmap. That should get you rolling once again. Great. Thanks. I wandered around a lot in Volthamp, but mainly before I got the ring. After that I mainly searched the surrounding areas in hope of a clue. Definately enough to get me going. Thank you for a great module. I have finished now. Another great module. The atmoshphere and plot is excellent. As some of the others i had a few walkability issiues (in the swamp and forest). I liked most f the quest and think I got most of them. Though a few of the quests was a little hard to tricker and I ran around for a long time trying to persue them, and a i had to look at the walkthough for the hint to dig for the pan flute. I spend a lot of time in those mountains trying this and that that didnt work (looking for Riddleworth Urm). It didnt help that some quests didnt seem to go from "active" to "finished" when I think they where complete: the essence of Hagra and trapped in a painting didnt, even after talking to Hagra and giving her her essence etc - I got her to talk alot, but the quest never updated. I tried alot of thing, but finally read the walkthrough and when I seemed to already have done everything it says I supposed it a bug or something? After playing I see I missed some interesting sub-quests by not wearing the burnt cloak. Is there any hints that you should wear it? Or are you suppose to just try it - it didnt have any powers, and so I just sold it. Thanks for playing, completing and taking the time to vote. It's appreciated! Hagra has always been a buggy quest-line, and I thought I had nailed everything out. The incomplete references are just from the journal, but if you returned her essence, then you indeed completed the quest. The cloak has no hints, although it having the marking of a God upon it, would be a hint for any Forgotten Realms fan. Yes, I already did. The number of votes didn't change. Got stuck in 'Awakening the dead'. In tower-bell, I placed gargoyle skull and rope on the workbench, used banshee skull, pulled the lever and received a message "You have yet to fix the bell..." Several times. On the old vault I encountered that someone had the same problem, but I don't know whether the author's response helped that person or not. The gargoyle skull and rope is placed on the bench, then you pull the lever to get the gargoyle skull into the bell, then use the banshee head to unleash its scream. Will verify this when I am home and near the toolset. "A small bench made of smooth rock which will allow you to fix the tower bell located a few feet away. To fix the tower bell, you'll need to place a coil of hemp rope and a gargoyle skull onto the workbench. Follow this by creating a Wail of the Banshee weave, cast directly on the workbench. By doing so, the hemp rope will coil itself through the eye sockets of the gargoyle skull, woven by the Banshee's Wail. Raise the hemp rope and gargoyle skull to the top of the bell tower by using the lever. Then pull on the rope to ring the bell." So to clarify, coil of hemp rope and a gargoyle skull. Then use the Banshee Skull on the workbench (might just fire without needing to target). Hi, FP, thanks for reply. I decided several minutes ago to give it another try, and, to my surprise, it worked! But I wonder anyway what might be the cause to this? Having the same problem with Awakening the Dead and the bell tower lever not working. 1- For me, uninstalling CEP1/going back to "stock" 1.69 fixed the Awakening the Dead quest. I have no idea what it was in xp2patch.key and/or dialog.tlk that mattered, but those were the only changes. 2- The disenchanting effect in Myth Unnohyr screwed up the Robes of a Dying Weaver, changing it from +2 AC vs evil to +5 AC vs lawful. This looks like a bug in cs_wdm_i , somehow exchanging the item property Subtype (5=vs evil, now 2=vs lawful) and CostValue (2=+2, now 5=+5).... and I have absolutely no idea how it did that. Anyway, it's a very well done module. My only complaints were that I kind of felt like I had Shadewood is more combat-heavy than Almraiven, and my character build was a little mistuned for that; and there was no safe way to get rid of the druid's animal companion after I determined that the tiger was consistently outclassed. Still holding out hope that I'll see the next part of this series one day! Greetings to all members of the Auren Society of Weavers! Fate of the Auren continues along, but it has been a slow crawl forward due to some real life changes. I've not updated the blog due to little changing in the development of the module. I moved out of my home last August to help take care of my father, and although I had hoped to use the free time to continue writing and building, I simply needed a break from doing so and focused on other interests. Work does continue though, such as polishing new load screens, adding music and playing the module to knock out bugs and bring side-quests together that run along with the main plot, but it has been pushed to weekends only for the most part. Thanks for the all support and to all who continue to play modules in NWN! First off, Almraiven and Shadewood are absolutely amazing! You truly have a gift for storytelling in a game format. I am in anticipation for the arrival of Fate or the Auren and I haven't even finished the second part yet. That said, I am having a tuch of an issues with burying/retrieving of the bones outside the Manor. Took me a little bit, but finally found the right spot to dig to make a hole and put the bones in. Went to the laboratory and rested til dusk three times I think. Went back up, found the spot, dug, and it tells me "You've already dug your hole". So I go back down and rest til next dusk, go back up, and get the same message when I dig. I have done this a number of times and still do not get anything else from diggin there. As I am not quite sure exactly what is meant to happen when the bones are ready, I am not sure if I am missing something or if something is not working right. Any help would be greatly appreciated as I am loving this adventure so much! Thanks for taking the time to play Almraiven and Shadewood, and apologies about this timed bug. I have the fix somewhere (it's due to a new in-game month rolling over and messing up the timer check). Zwerkules reported it as well. To fix this, you'll need to go into DebugMode. Do this where you placed the bones in the ground, and adjust your mouse so the placeable can be spawned. Then open up the Festering Dirt placeable you just spawned and grab the Festering Bones. This will update your journal for the next stage of your assignment and set all appropriate variables. From there, you should be good to move forward. Due to this bug, Volothamp: Buried Bones will remain incomplete but it will not stop you from completing the module. Hiya! =) Thank you for the speedy reply! Also, once again, any help in resolving this is appreciated. Look forward to finishing it. Check your private messages. I've sent you my e-mail so you can send the save game. I'll get you moved forward. All sorted, I have now completed this incredible part two of the story! Thank you again for your help with the bug. Count me among those eagerly awaiting the final chapter. Amazing work. But the module is still worth a rating of 10. I hope when the third part comes out there'll be a way to play it without a database from the end of the second part. I did like the first two parts, but I don't want to play them again to be able to play part three. I probably have the character, but not the campaign data-base. I still have no idea if it is possible to see if I already voted for something or not. NWN pathfinding is terrible. 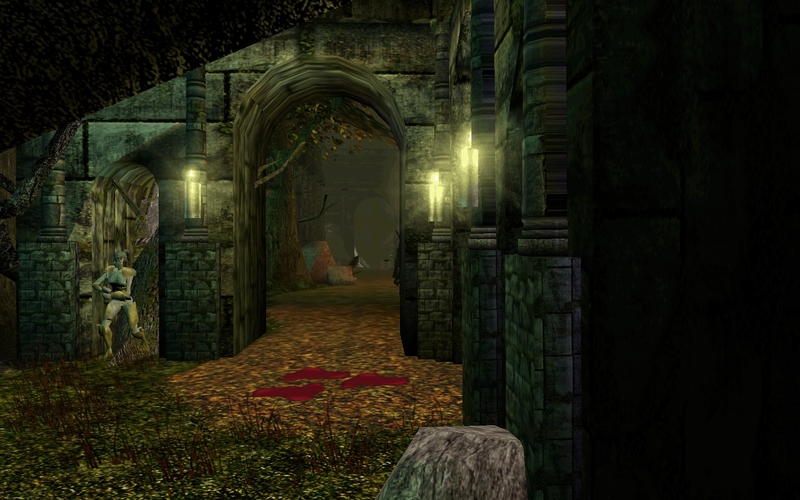 There were moments in Shadewood where it felt less than playing wizard trying to solve a dark mystery and more like a mini-game of "try to guess where your character is going to run next, because it certainly won't be where you have ordered them to". This and Almraiven are my favorites, but where is Fate of the Auren?!?!? hi!!! where can i find regeants for the spells or brewing potions in Shadewood??? I can not find neither Bone dust nor owl's eye for example..
also there are place where is too dark to walk in the dust wood and with the light spell you can not see anything! Thanks for stopping by Zwerkules, chimaera, calgacus and faerunian! @calgacus - Fate of the Auren is still puttering along, just not at the rate I had planned. A number of RL twists and turns have got in the way and is chewing up a lot of my spare time at the moment. @faerunian - Bone Dust can be made by grinding bones or skulls in which you find in the forest. Use the mortar in your laboratory if you have found it. 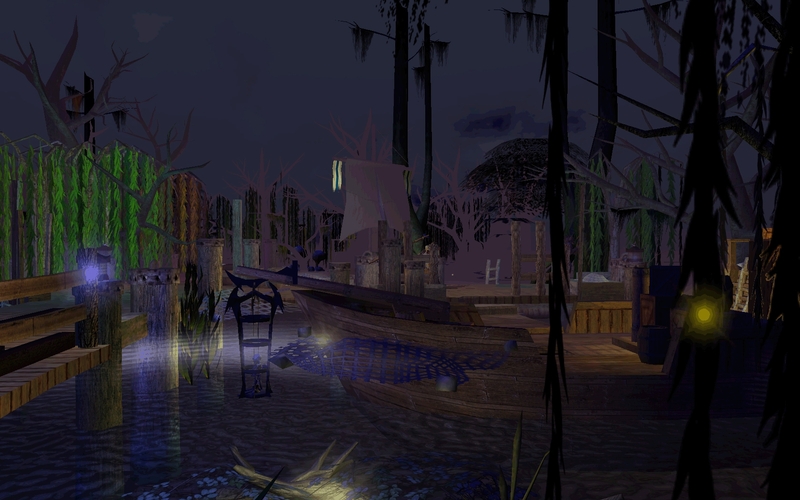 Otherwise, it can be purchased in the Spider Swamp by locating the slave trading town nestled within. Owl's Eye can be found by killing the Owl in the Abandoned Temple. It will only be there as a creature once you have a requirement to brew a potion that needs this reagent. If an area is too dark, you can try a torch as well, but otherwise, it is magical darkness normally placed on the very edges of maps where nothing would normally be. From memory, there is one spot behind One Copper Inn that is very dark, but it is not required to see for the side-quest to pop-up. I'm glad that you're still developing the third and final chapter.